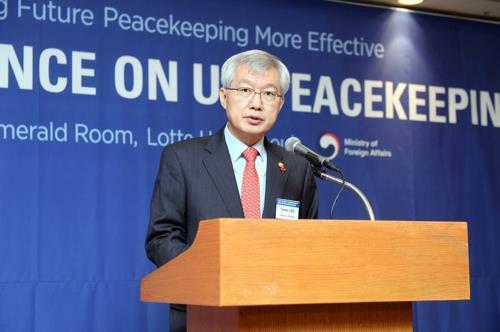 SEOUL, Dec. 3 (Yonhap) -- An international conference on peacekeeping operations (PKO) got underway in Seoul on Monday to commemorate the 25th anniversary of South Korea's participation in the U.N.-led activities, the Ministry of Foreign Affairs said. The two-day Seoul Conference on U.N. Peacekeeping has brought together government officials from around 20 nations, including Germany, Sweden, Ethiopia and Indonesia, as well as representatives from international organizations and related experts. The participants plan to explore ways for the development of the U.N.'s peacekeeping operations. South Korea has dispatched PKO troops to Somalia, Angola, West Sahara, East Timor and Haiti since 1993. Currently, it has some 650 troops in Lebanon and South Sudan. "The government plans to make constant contributions to the development of PKO, a core activity of the United Nations," the ministry said. This year marks the 70th anniversary of the U.N.'s involvement in PKO.